IT’S NO YOKE. The real-life, reassembled elephant bird egg. The newly remodeled “Reading Nest” at the Children’s Museum of Eau Claire has some things you might expect and one thing – a very big thing – that you probably won’t. The cozy corner of the museum by the first-floor elevator features a “nest” that’s perfect for sitting with your little one and reading. There are children’s books, a colorful nature mural by local artist Cyndee Kaiser, and a display of model eggs of Wisconsin bird species, including the bald eagle, killdeer, robin, and hummingbird. In the corner is the biggest egg of all – and this one is real. 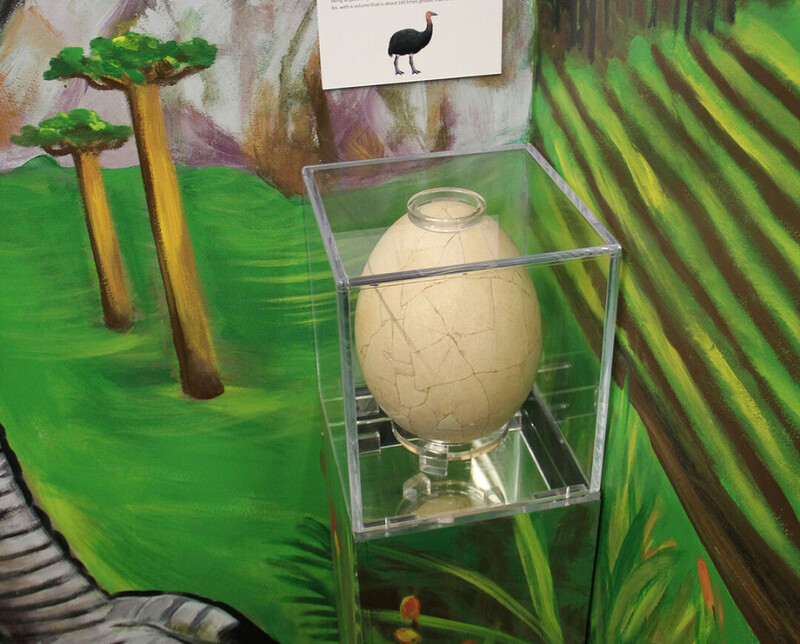 It’s an elephant bird egg, its shattered shell painstakingly pieced together and protected under plexiglass at a child’s eye level. Above the egg looms a life-sized painting of an elephant bird, stretching 10 feet toward the ceiling. The egg was a gift of Bernard and Marge Holler of Eau Claire, who purchased it when they lived in Africa in the 1980s. Bernard, a former UW-Eau Claire professor who worked at American schools in Africa for about a decade, had admired a similar egg during a visit to Madagascar. His local contacts sought out another such egg, which had been reassembled from fragments found buried in what had been an elephant bird nest. Bernard paid just $65 for the egg, which was a deal. As you can imagine, elephant bird eggs are rather rare: Intact specimens sell for tens of thousands of dollars, and even pieced-together eggs are worth a pretty penny today. Bernard says he hopes that kids and adults alike who see the egg take a moment to marvel over the miracles of nature. “God’s got a wonderful world here,” he said. The egg isn’t the first piece of natural history the Bernard and Marge have given to the museum: In 2016, they donated a carved elephant femur, which they also obtained in Africa. It’s now part of an exhibit next to the elevator on the museum’s basement level, where the enormous leg bone is compared with the size of a child. Since the Hollers returned to Eau Claire from Africa in 1995, the egg has sat safely at the bottom of the couple’s china cabinet, where it survived intact despite visits from grandchildren and great-grandchildren. Phil Rechek, the museum’s director of facilities and exhibits, said there were fewer than 40 intact elephant bird eggs in the world. “I can guarantee that none of those are in children’s museums,” he quipped during a brief unveiling ceremony for new display. In other words, kids (and parents): Handle with care!